Lime Kiln Road, S.L. Shelton's 10th book and his first serial killer thriller, now available for Kindle or in trade paperback. For six years, a serial killer has plagued Lowder County, taunting law enforcement and terrifying the population. All of the victims share a dark secret that dies with them. No one survives... Not until seventeen-year-old Gee. Drugged and wounded, Georgia escapes painting a bloody trail in the snow behind her. In the process of dragging herself to safety, she's able to save the life of a second teenage victim, Josie. But the first survivors of the maniacal murderer leave detectives with more questions than answers. Gee's memory blocks may hold the key to stopping a killer who has taken the lives of 12 people. As all parties struggle to find the missing pieces, the killer's timeline is escalating and he's straying from his pattern. Can the two victims team up with a local detective to stop the Catoctin Creek killer's deadly spree? Or won't they be as lucky the second time around? "A taut game of cat and mouse played on a razor's edge. One where you're never sure who is the cat and who is the mouse. 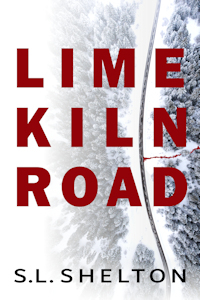 Lime Kiln Road comes at you like that car in your rearview mirror that's been following you for too long, the one that keeps inching closer until it's riding your bumper and there's no escape." This site, the artwork, and content Copyright Â© 2015 by S.L. Shelton. All rights reserved, including the right to reproduce in whole or portions thereof in any form whatsoever. The books listed and described on this site, including all content are Copyright Â© S.L. Shelton unless otherwise specified.